To ensure perfect function of the ACC (Adaptive Cruise Control) together with the brake assistant system, the radar sensor must be adjusted and set so that it promptly recognizes both high and low clearance vehicles, e.g., trucks and flat trailers moving directly ahead. The vertical alignment of the radar sensor has to be checked, adjusted and set. The Distronic Plus Adjuster 09807-10 is attached to the surface of the radar sensor via suction cup whereby 2 support rods fit firmly in the recesses of the radar sensor. 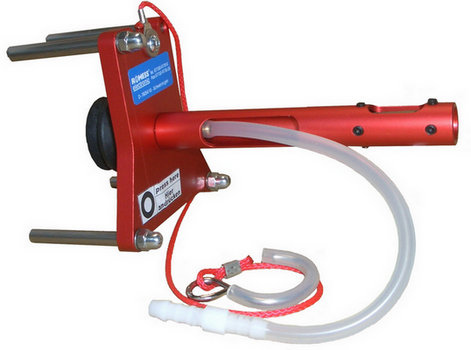 The suction cup vacuum pressure is set to at least 600 mbar with a hand pump. The vertical alignment of the radar sensor is read off the level provided and, if necessary, corrected with the setting screws.